Back cover: The back of a four page leaflet of Vebruary 1885 aimed at the visitor from the United States of America. 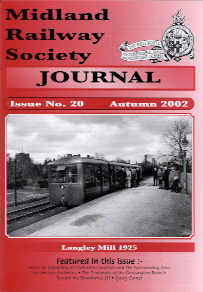 The front page gives a brief description of the Midland Railway’s facilities and comments on features to be seen along the toute from Liverpool to London and the surrounding districts. The second and third pages contain a number of vignettes of tourist locations. As will be seen, this particular page gives the times and trains between Liverpool and London and details of sailings of the ‘Guion Line.’ Note that the Midland would put on a special train from Liverpool for 50 or more First Class passengers on receipt of a telegram from Queenstown. Records show that the Guion Steamship Company went into voluntary liquidation on 20th February 1900. 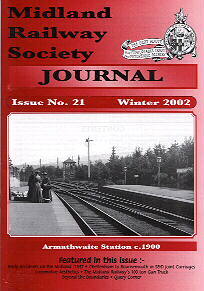 Cover photo: A rare photograph of a Sentinal-Cammell railcar at the Ripley Branch platform at Langley Mill in 1925. Judging from the number of railway employees in the photograph, it would appear that this was one of the first trial runs. 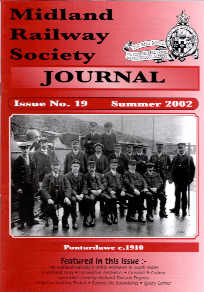 See under ‘Comments on items in previous journals’ for further information about these trials. Back cover: Another reminder of the centenary of the Grassington Branch in this handbill which advertised the new services commencing on Wednesday 30th July 1902. It is possibly unique in showing connections from no fewer than 39 stations on the Midland system - a feature that probably took some time to compile and then check when the proof was returned from Bemrose. Although it is dated 25th July, the reference in the bottom left shows that the 5,000 copies ordered were not produced until the 29th July, which may have resulted in some stations not receiving their copies until the opening day. New query 33: Where was this crossing?